Video Showing the Inner Workings of the Maillardet Automaton | @TheFranklin « Adafruit Industries – Makers, hackers, artists, designers and engineers! 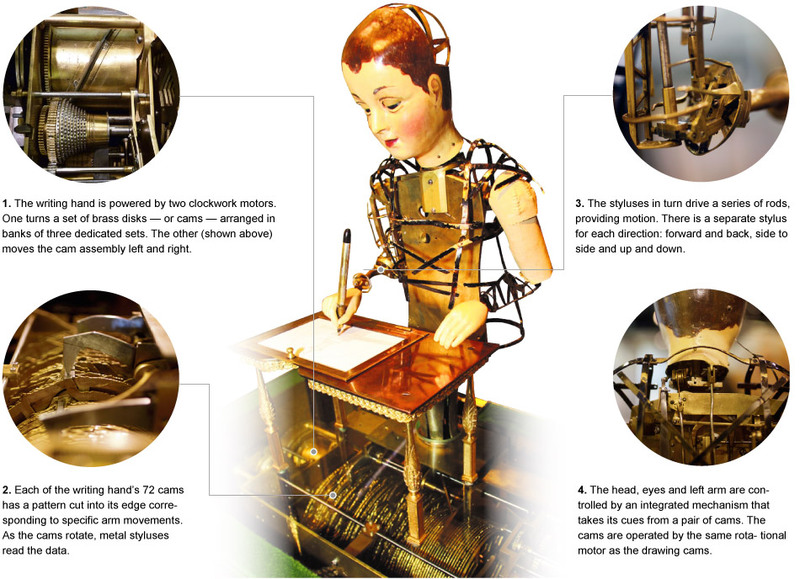 A montage of closeups illustrating the dance of the inner workings of the 220+ year old Maillardet Automaton in action. I shot this footage in February 2014 during some routine maintenance at the Franklin Institute, with Andrew Baron and William LaFond also present. What, no audio? Actually the sports exhibit hall is right outside the door and the noise of that drowned out any sounds the Automaton makes, which is actually almost nothing. The Maillardet Automaton is quiet by design, as its clockwork is entirely encased in the cabinet base, so when running it makes no noticeable sounds.